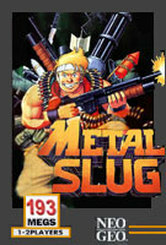 The gameplay mechanics are the same as in previous Metal Slug games; the player(s) must shoot constantly at a continual stream of enemies in order to reach the end of each level. At this point, the player confronts a boss, who is usually considerably larger and tougher than regular enemies. On the way through each level, the player can find numerous weapon upgrades and "Metal Slug" tanks. The tank is known as the SV-001 ("SV" stands for Super Vehicle), which not only increases the player's offense, but considerably adds to their defense. In addition to shooting, the player can also perform melee attacks by using a knife and/or kicking. The player does not die simply by coming into contact with enemies, and correspondingly, many of the enemy troops also have melee attacks. Much of the game's scenery is also destructible, and occasionally, this reveals extra items or power-ups, although most of the time it simply results in collateral damage. A new feature in Metal Slug 3 is the branching path system; in most missions, there are forking paths from which the player must choose one, each with their own obstacles, and each of varying length and difficulty. All paths eventually lead to the same boss battle, but the player may have different equipment, and may have rescued more or fewer POW's depending on their choice of path. When doused with infectious material, the player becomes a zombie. While medication is available to reverse the effect, the zombified player can make use of a devastating (but slow) vomit attack that covers most of the forward area. The player cannot crouch or jump high, but is immune to attacks from enemies (except zombified enemies). If a zombified player comes into contact with infectious material, they will die. Underwater, the player equips a Scuba set with a bubble helmet. Rather than grenades, the player uses a bomb-launching system with the ordnance affected by gravity. When flying, should the player lose their vehicle, they rely on a backup jet pack that can fire heat seeking missiles. When in space, if the player loses the Astro Slug, they must depend on a jet pack and a breathing apparatus. Explosives are contained in the pack, and when fired they cause a massive fireball. On the Neo Geo console versions of the game, once the arcade mode has been beaten, there are two additional mini-games: "Storming the UFO Mothership" and "Fat Island". This mode allows the player to control one of General Morden's soldiers as they attempt to rescue fellow soldiers and attack the UFO forces. The player can choose between the "Riot Shield Soldier", "Bazooka Soldier", and "Grenade Soldier". The player is given a single life, which is balanced by the number of reinforcements from fellow soldiers. Two players compete to gain the most weight in a limited amount of time by eating various foods. They start out at 100 kg and must finish at 200. If players lose enough weight, they will return to normal size and subsequently to a mummy state.